There can be a huge difference in quality between the suburban papers. Most of them are chock-a-block with real estate ads, but you can also find some interesting articles about your local area. Do you think one stands out above the rest? A few years ago I would have said the St George Leader, but it has really gone downhill over the last couple of years - I believe Fairfax has had a big part to play in that. The Mosman Daily is quite good. The St George/Sutherland Shire Leader would be a contender, however, having also lived in the Inner West I would have to say the Village Voice - although I think that newspaper no longer exists. The city based 9 to 5 Magazine was good until it was scrapped. Otherwise I am not a fan of newspapers at all. I think the Manly Daily is great. It is always well balanced with lots of local news and lifestyle articles. 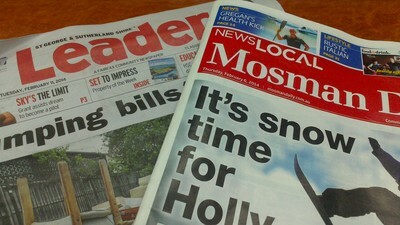 Since I’ve lived just about my whole life in the Sutherland Shire, the only local paper I’ve read is the Leader. I’ve always looked forward to reading it twice a week. Earlier this year I happened to be on the cover of 1 of them, due to a council meeting I was about to attend. I’ve also been in the sports session at the back, because I won a autographed soccer ball, a long time ago, in a competition that a bank ran. I didn’t even know I’d entered the competition!